A chartered plane carrying nearly 300 Gambians faked a fuel emergency to land in time for a football match in a youth tournament in Peru, officials say. The plane should have landed in the capital, Lima. However, when the fans realised they would be late for the game, the crew radioed the Peruvian authorities to say the plane was low on fuel. 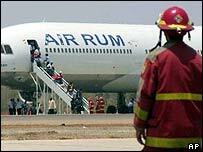 The plane then made an emergency landing in the northern city of Piura, where the game was taking place. The Gambian fans, dressed in national colours, were allowed to disembark and watched their team beat Qatar 3-1 to qualify for the quarter-finals in the Fifa championships. Football fever has swept The Gambia since their under-17 team beat pre-tournament favourites Brazil last Saturday in their first game in any world championships. Gambian newspaper Daily Observer says the group's trip to Peru had been delayed by a week and they had been forced to watch the historic victory over Brazil on television at home. However, their celebrations could be dampened by the reaction of Peruvian officials. Thinking the plane's problem was real, the Peruvians had declared a red alert and scrambled the emergency services. The Gambians' plane has now been impounded, and the airline could face penalties. "It truly was a scam," said Betty Maldonado, a spokeswoman for Peru's aviation authority, CORPAC. She said the plane had been chartered by Gambian President Yahya Jammeh and had entered Peruvian airspace "without permission".